Maruti has always been good with their small car in the Indian market. The strong dealership network gives Maruti nothing to complain when it comes about entry and mid-segment sedans. While most of the Maruti cars are attracting much of the attention, Kizashi and SX4 have never been able to grab the piece of market that Maruti has expected. This has forced Maruti to put a stay on the import of the Kizashi model. 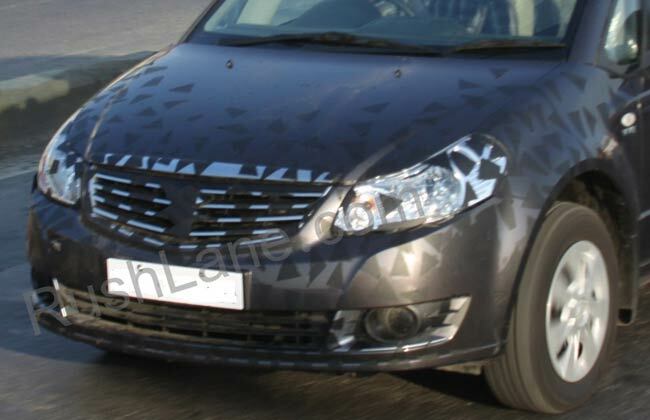 But as far as SX4 is concerned, Maruti still has some hopes left for this model, Maruti testing a test mule of the SX4 was recently spotted in Gujarat. The new facelift version has received minor changes to its front part which now boasts of new honeycomb mesh designed grille. The bumper has also been tweaked. The pictures however, do not reveal anything about the interior or the technical specifications and we also are not expecting for any change. Currently SX4 is powered by a 1.3 litre Multijet diesel engine and another 1.6 litre K Series petrol and CNG engine. So, Maruti is thinking to beat some big players like Skoda Rapid, Volkswagen Vento etc. by few minor cosmetic changes.